I mentioned Blossom, the salon where I get my hair cut in downtown Mesa, is also a boutique, right? They have the CUTEST stuff in there. I always try to show up early to my hair appointments so I can browse through all the unique and adorable jewelry, accessories and clothing they have to offer. There's something for everyone! If you're ever downtown, be sure to check them out. 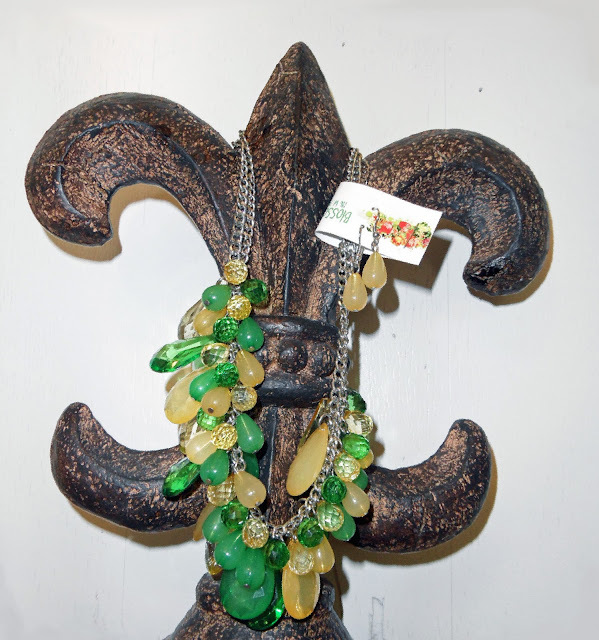 Brooke, the owner of the boutique, has generously donated this stunning jade green and amethyst yellow necklace and earring set for Stacy's auction! Thanks a ton, Brooke. This jewelry set features chunky teardrop stones on a silver chain that won't tarnish. When worn, it falls just below the collarbone. What a great way to dress up any outfit! The winner of this auction will receive the above pictured necklace and earrings via postal delivery. THIS PACKAGE IS VALUED AT $25.00. BIDDING WILL START AT $10.00 AND WILL INCREASE BY A MINIMUM BID OF $1.00 PER BID.